(AP) ASHGABAT, Turkmenistan - Ice hockey is hardly the most suitable sport for a desert nation where temperatures can soar as high as 120 degrees Fahrenheit. 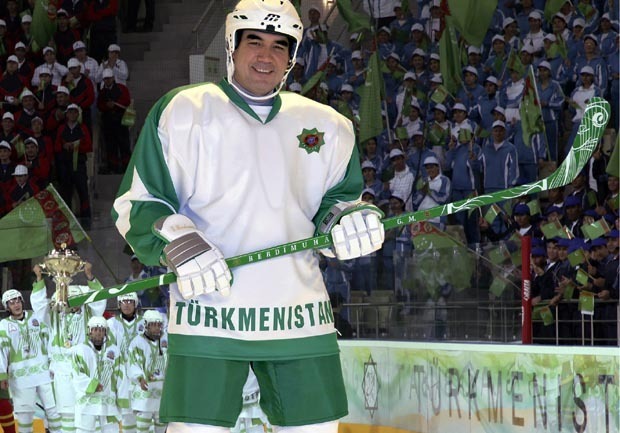 And yet, Turkmenistan's President Gurbanguli Berdymukhamedov has ordered state enterprises and departments to create a hockey league. State daily Neutral Turkmenistan reported Wednesday that the police are already busy setting up their own team. Turkmenistan has overcome the weather issue by using revenue generated from its natural gas exports to build costly indoor skating rinks. Critics of the idea are unlikely to make their thoughts public in a country where government opponents face severe reprisals. Berdymukhamedov has in recent months been busily preaching the need for his former Soviet Central Asian nation to become a sporting power and has personally led the way by showing off his active side. At the weekend, he donned ice hockey garb and skated in front of thousands of people at a recently constructed indoor arena in the capital, Ashgabat. Afterward, teams played in the country's first ever ice-hockey tournament  one of several events organized for the "Week of Health and Happiness" recently devised by Berdymukhamedov. Earlier that same day, the president unexpectedly took part in a time-trial car race, and won. These displays appear to be part of a state-engineered design to project the president  who won presidential elections in February with 97 percent of the vote  as a man of action. The ceaseless idolization of the leader bears strong hallmarks of the cult of personality built by Berdymukhamedov's eccentric predecessor, Saparmurat Niyazov, who died unexpectedly in late 2006. In previous outings, Berdymukhamedov has been seen jogging, playing volleyball, riding horses, cycling, practicing judo and taekwondo, and shooting at the firing range. In the nonsporting field, state media has reported on Berdymukhamedov, a 54-year old trained dentist, removing a tumor from a cancer patient and flying a plane.